India’s largest development and CSR platform-NGOBOX has published a report on ÇSR spend analysis of private limited companies. This is the first report on CSR analysis of unlisted privately owned companies in India, after the enactment of the Companies Act 2013. The report is based on the analysis of 305 privately owned unlisted companies, including a few of the biggest brands like Google, IBM, Microsoft, Barclays, HSBC, Sony, LG, Samsung, Visa etc operating in India. The report brings out analysis of the prescribed CSR spend and actual CSR spent of the financial year 2015-16. According to the report, 39% of the private unlisted companies failed to meet the CSR compliance that requires 2% of the average net profit of the previous three years to be spent on CSR projects. However, 29% companies went beyond mandatory CSR limit. While almost 2% of the companies did not spend any amount on the CSR, despite having mandatory CSR spend requirements. 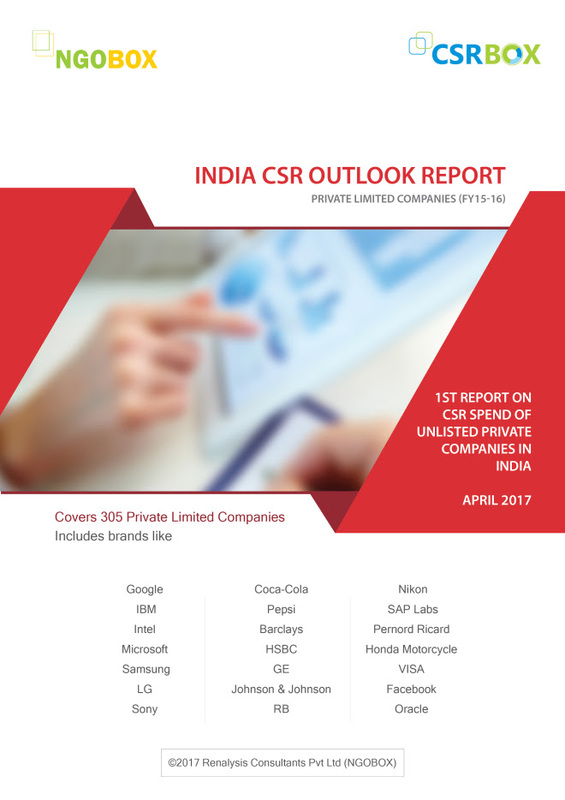 This report was compiled on the basis of availability of CSR data as of 31st January 2017 from relevant sources and companies with prescribed CSR of INR 15 lacs or above. Out of 305 companies, only one company had prescribed CSR range of more than 100 crores. Most of the companies (156) had a prescribed CSR which ranged between 1-10 crore. As few as 14 companies had prescribed CSR between the ranges of 10-100 crores. The total prescribed CSR of 305 companies amounted to Rs 954.18 crore and the actual CSR spent was around 707.87 crores. The total unspent CSR was rounded off to 26% whilst actual CSR spent to prescribe CSR was 74%. Implementing agencies remained the popular method by which the project was implemented as 62% (1020) projects were implemented through Implementing Agencies followed by the direct implementation which amounted to the implementation of 36% projects. Only 2% projects were implemented through CSR Foundations. Moving on to the unspent CSR, 118 companies did not spend the prescribed amount on the CSR and 24 companies (20% of those who did not spend) did not explain the reason behind their unspent CSR budget, whilst 19% of the companies suggested that their project begins next year. Under the Companies Act, it is mandatory to give a reason for unspent CSR amount. Education & Skilling were the areas where the most CSR spending happened. According to the analysis, Education & Skilling were the areas where the most CSR spending happened. Almost 50% of projects took place in this area followed by Poverty Alleviation, Malnutrition, WASH, and Healthcare where 23% of the actual CSR budget was spent. Overall 7% of the actual CSR spent was on administrative expenses. Areas like benefits to armed forces veterans, war widows, urban slum development etc. were not able to get much attention of CSR committees of these companies. The geographic distribution of CSR funds has been quite erratic and unequal. Top 5 states (Maharashtra, Gujarat, Karnataka, Telangana and Tamil Nadu) received almost 2/3rd of the total CSR funds. Meanwhile, Maharashtra topped the list by receiving 1/4th of the total CSR fund (i.e. 27%) followed by Karnataka with 11% of the funds received.